Blogging is becoming increasing popular, not only as a hobby but also as a profession. 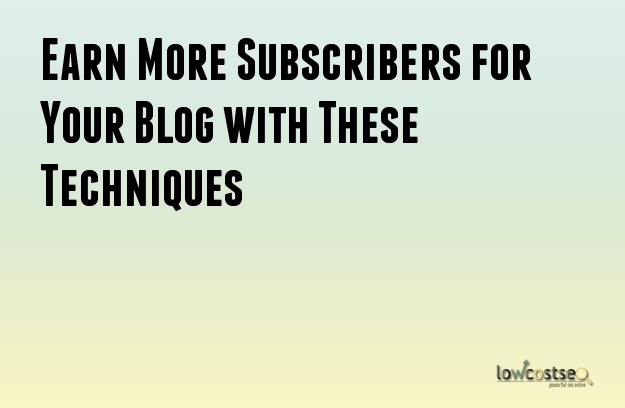 The success of a blog depends on the number of subscribers it has. Bloggers who understand the importance of the email list will be able to get more subscribers and as a result earn more from their blogs. Building an email list is extremely important and it will help you reach scores of audience across the globe. However, creating this list is not at all easy. It needs a lot of dedication and knowledge of the proper techniques. There is an option of getting paid subscribers, but this is not the preferred method for many bloggers. The best way to remain on the top of search engines is going for organic techniques. One simple way of doing this successfully is by using Facebook Ads. You can easily create a huge email list of around a thousand subscribers with the help of these ads. However, if you put the effort into building an email list, the readers will be more comfortable with you and they will trust you more. There are some techniques of doing that which are given below. Building A Link On The Landing Page: Having a strong lead magnet is very essential if you want to build a suitable email list. This is irrespective of whether you use paid subscriptions or not. You should have a viable reason for the people to give their email ids to you. They can do it for a tool, free eBook or some kind of subscription. You have to give them something that will encourage them to sign up with you. If they give their id to you, you are indirectly given permission to pitch your products to them. Facebook Ads: First you need to get your landing page ready. You can use a paid or a free channel for this purpose. Facebook is a highly active forum that can reach across a huge number of potential audiences all over the world. If you want to make your product and services visible to the customers, you can do it via this platform. If you are able to generate a good campaign, you will be able to reach a huge number of audiences. When you first create a copy of the ad campaign, the initial costs will be pretty low. The cost will go up gradually. This is because the people who see your ad will click on it and go to the page. But, they will not click on it the second time. This will lead to the CTR going down and the total cost of the thing will go up. Optimize the Campaign: If you have a very low conversion rate, you need to get the Facebook campaign optimized. For campaigns you need to test its success with different headlines and also pictures. This way you will understand what will work and what not. You can install Facebook pixel on your site before the campaign begins and see it work for itself. These tricks will certainly help you to up your ante and get good results.